This month I will be discussing Wardrobe Organisation, each week will be a different area we are going to clean, declutter and organise. This week…handbags!! Have you used it in the past 6 months? Does it still function well? Can you see a purpose for it in the near future? Did you answer No to any of the above? It maybe time to declutter your collection, use this space for other items in your wardrobe. 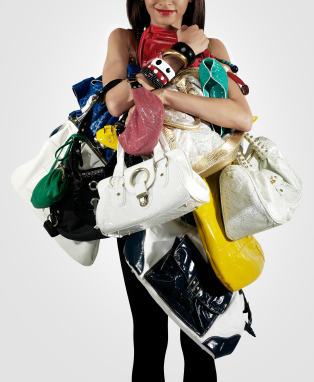 Can you declultter at least one handbag? Tomorrow’s topic is organising your handbags. My thing is shoes. I have one handbag, one simple black clutch and my Japan-souvenir clutch in gorgeous fabric. Love the simplicity of your collection! The good thing about having teenage girls is that we all share our handbags. Good thing we have similar taste! I would love to hear about ways to store them. Anyway the storage solution we devised for her bags were 3M hooks inside her wardrobe side walls and doors. To get the correct spacing of each hook start with the biggest bag at the bottom and allow an inch above so it doesn’t drag each time you open the door on any shoes etc you may have in the bottom of the wardrobe. And then progress up with the flattest/smallest at coathanger level. 3M type hooks have the advantage of being moveable when you change your bag collection! The trick now is getting her to use the hooks or the wardrobe at all!! I’m looking forward to my girls getting older and sharing things!! Great work anne, 1 is a perfect start! Am I wierd? I only have 3 handbags! Two are leather that I won’t part with (and I alternate using them) and the third is my current large, vinyl 9leather look) bag which holds lots of useful stuff. I regularly clean it out and re-stock bandaids, hand cream, mints, tissues, wet wipes, note book, pens etc. No, I don’t have many either. I can’t wait for tomorrow’s post. Would love to see how I can finally organise my collection of handbags. I have to confess, i still have all of the handbags I’ve bought in the last 20 years! I am attached to them all and they are all dusty up on top of my wardrobe. You’re right. I should retire them and let them move on to greener pastures. Do you use them all Melissa? Try parting with a few at first. LOL Melissa, how about you part with 5 and you can buy 1. Deal??? LOL, I can only imagine what that handbag looks like. Do you use it? Perhaps your kids or the local kindy would love to use it for dress ups?? It’s a challenge for you Alicia. Start looking through and part with the ones you have used the least….it’s a start. Thanks for my 7 coathangers that got emptied once I had culled 5 bags. I have 3 occasion bags that I’ll never get rid of (wedding type ones) that are store in a basket on the top shelf of my wardrobe, and the other five are looped over a four-skirt hanger at the moment. No point coming up with any permanent solution as we are moving in a month and I’m not sure how big my wardrobe will be yet. I am tempted by the 3M hook idea though. I used that in our last place for my beads and scarves. 3M’s are great I use them for everything. Good luck with your move! I’m going to do a cull once I get the wardrobe finished. You have given me some great ideas. I have one nice expensive handbag that is perfect condition on the outside but the lining is completely torn on the inside, so i don’t use it. I want to get it fixed, anyone know how to go about this…?